Winter invites your imagination to soar – and lends itself to create a glamorous and magical event. With the right planning you can create a wonderland that dazzles with elegance and is perfectly brought to life with the colors of the season. Some couples will marry on or close to the Winter Solstice, while others weave into their wedding many of the symbols and traditions that are celebrated at this time of year. Here are a few of the most traditional elements to keep in mind as you plan your winter wedding. 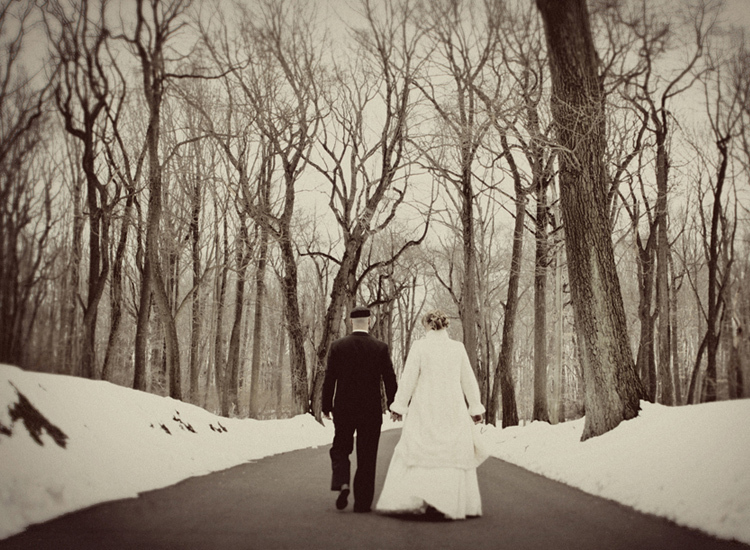 A winter wedding is an appropriately elegant and classy affair – and very versatile as well! 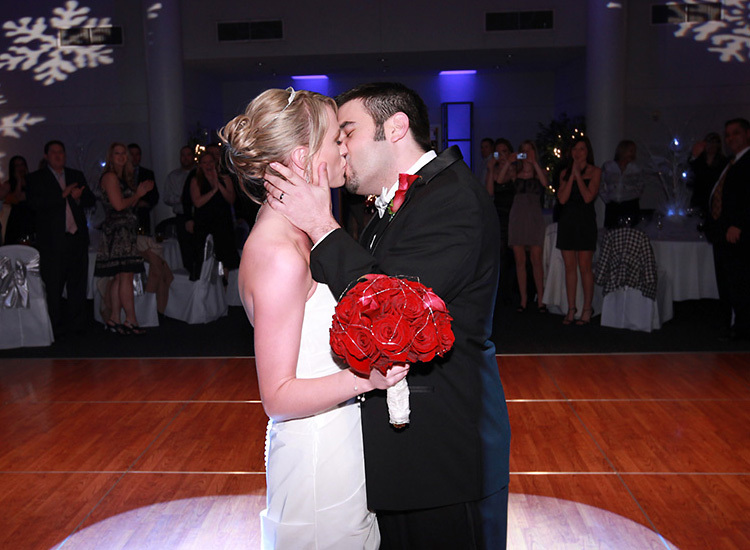 Your special day can perfectly accented with the many themes and symbols of the season. Where you live might influence your decision about a gown; a milder climate invites a strapless and sleeveless outfit, but if snow and ice are in the picture, a sleeved gown and flowing cape can help you get from the ceremony to your reception in style and comfort – not to mention it makes for stunning bride and groom portraits! Strong color combinations are a staple of winter weddings. Traditional brilliant white gowns with seasonal patterns and silver accents are striking when paired with a bold red or green throw. And of course your fiancée will look dashing in classic tails with a matching red boutonniere. For your wedding party, delight your bridesmaids with attractive wraps that they can keep after the day of the wedding. With the right planning you can bring to life moments that you’ll remember forever. Most couples choose to have the ceremony at their church or temple and then host their reception elsewhere. Inns and lodges with roaring fireplaces and a warm and charming atmosphere are always perfect locations for a grand winter wedding. More intimate settings often include cozy bed and breakfasts and quaint cottages. Of course everyone dreams of a white wedding – and with the right planning (and geographic location!) you can celebrate your union as snowflakes fall softly on the ground, creating a wonderful setting for wedding day pictures in a winter wonderland. It comes as no surprise that the old and elegant standby of white and black is the go-to color theme when couples marry, but it doesn’t have to just be those two colors that you invite to your ceremony and reception. Rich and deep hues like royal purple, navy blue, ruby red and forest green will bring your setting to life with vibrant accents that are unmistakably tied to the season. However, many modern brides will opt for a different color palette using sapphire, turquoise and ice blue paired with silver, white and even cream to invoke a pure and timeless setting that is warmed by candlelight. Depending on persuasions and tastes, décor can be whimsical and tied closely to the season with ornaments, ribbons and symbols, or it can feature iridescent spheres, snowflakes and sparkling pine cones set upon fresh pine boughs and garnished with cranberries. One thing is for certain – there are no hard and fast rules when it comes to your imagination! Poinsettias are a seasonal favorite and can be had not only in traditional rich red, but also in white or variegated varieties. Many couples will use these lovely flowers as their primary floral theme throughout and even feature them as centerpieces and as favors – a tiny poinsettia in a charming pot makes a tasteful gift. But there are many other flowers to choose from including roses, anemones, lilies and amaryllis. And evergreen boughs, silver-dusted pinecones and holly branches with red berries contrast beautifully against elegant sprays of exuberant orchids. A classic winter wedding table typically calls for white on white with silver or platinum accents. White flowers in slender vases with frosted spheres and silver candles complete the setting. A more rustic and earthy look invites browns and mossy greens, laid over with copper and ivory, with a centerpiece featuring ranunculus or roses in copper urns or moss-covered wooden vases, all lit by snowflake votives to create a laid-back and relaxed atmosphere. And if you’re looking to create a grand and glamorous look pair cream with ruby red and burnished gold. The brocaded linens and gold-accented flatware will be set off perfectly with fiery tulips and matching floral arrangements attached to the back of each alternating chair. Wedding favors can include everything from engraved ornaments if you and your guests celebrate Christmas, to gold and silver candles, almonds covered in white chocolate, and gourmet chocolates shaped like snowflakes and monogrammed with your initials. Warm and cozy comfort food is always a surefire way to delight your guests. Hot chocolate, mulled wine and eggnog are good ways to warm up your guests. Creamy butternut squash soup and petite quiches set the stage for the main course which will often feature turkey or a succulent roast. Delightful vegetarian fare can include vegetable brochettes, spicy ratatouille or vegetable lasagna. And of course your wedding cake has to be outstanding, so think about rich flavors – like orange and chocolate or buttercream and caramel, enrobed in a dazzling white frosting and trimmed with your theme colors. The shape of your cake can be inspired by the symbols of the season, or you can simply add a few accents like sugar pinecones and snowflakes to keep a clean and elegant look going; one that will come across brilliantly in pictures as the two of you make the first cut hand-in-hand.